Great Boughton Parish Councillors have listened to local residents and have agreed that the surplus land adjoining Caldy Valley Church and Neighbourhood Centre in Great Boughton should be kept as a public green space. The parish council recently held a public consultation to ask local residents what they thought should happen to the land which is mostly grass, shrubs and trees. The parish council had been approached by a fast food franchise who was interested in purchasing the land. Over 200 local residents responded to the survey and most felt that local roads were already suffering from too much traffic congestion and that the land should be kept as a green space. Residents also cited fears over increased litter, smell and noise and some were concerned about the loss of wildlife and trees. New tree for Great Boughton Library! 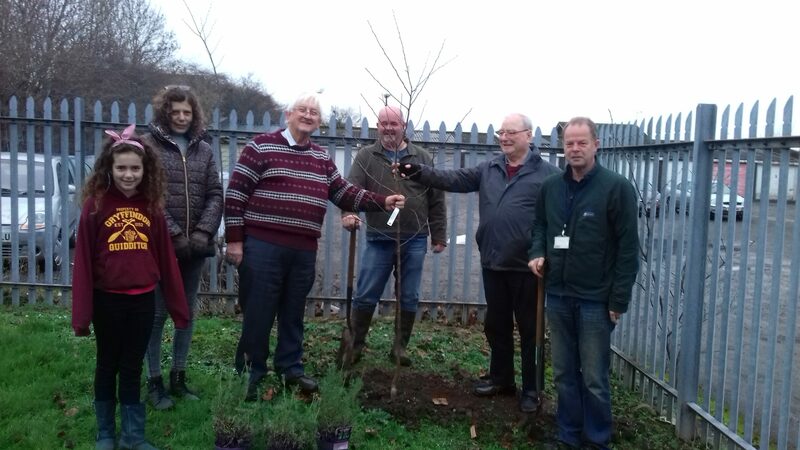 Representatives from Great Boughton Library and Great Boughton Parish Council met to plant one of many trees being planted by the parish council as part of its commitment to the Woodland Trust’s Tree Charter. The Malus Everest – a species of crab apple was planted to replace a diseased elm tree that had to be removed and has been surrounded by lavender bushes. The call for a Tree Charter was initiated in 2015 by the Woodland Trust in response to the crisis facing trees and woods in the UK (https://treecharter.uk/) as there was no clear, unifying statement about the rights of people in the UK to the benefits of trees, woods and forests. Other trees will be planted at Queens Road Field in Vicars Cross and at Vaughans Lane in Great Boughton over the next few weeks.